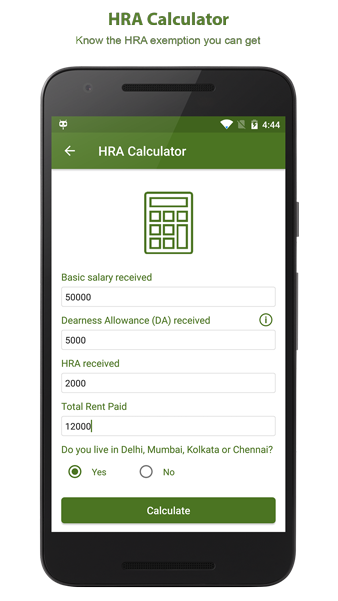 Here we bring to you, our HRA Exemption Calculator, which makes HRA calculation handy and tells you about the HRA Exemption, you are eligible for. An individual can claim House Rent Allowance HRA, by doing this they can easily pay their rent and the related expenses. Salaried individuals who live in a rented house can claim HRA exemption, by this, they can increase their tax deduction and can get some relief from paying taxes on their taxable income. A salaried individual can get full or partial HRA exemption, for getting this exemption he/she must present all the required documents to the employer, including the rent receipts, which is a proof of actual rent paid by the individual. If a salaried individual is staying in a rented apartment, in a metro city, then 50% of his/her basic salary is exempted based on tax slabs. For the individuals, who stay in a non-metro city, 40% of the basic salary is exempted from the IT rate slabs. If a person receives HRA from his/ her employer, then it is exempted from taxes. As per section 10(13A) of the Income tax act 1961, an individual can do HRA exemption calculation, when you reduce 10% of your total salary from the actual rent paid. If an individual gets House rent allowance and he/she does not live in a rented apartment, then the actual HRA received by the individual will be completely taxable. To get maximum possible deductions and to calculate House Rent Allowance, use our advance calculating system. All you need to do is fill the correct information accordingly and get your House Rent Allowance exemption details in no time. Then you need to enter your basic salary, in the space provided for the same. 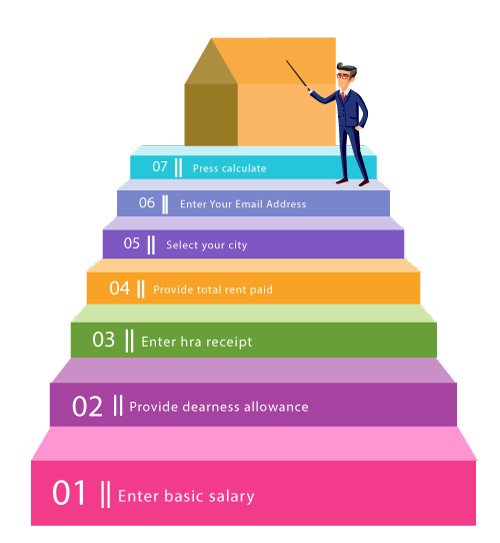 You have to enter your Dearness Allowance after entering your basic salary. After putting your Dearness Allowance, you need to provide your actual HRA received from the employer. Then, enter the actual rent paid. You need to provide you your name and the city you are living in. Enter your email ID in the space provided. Then you have to click on the calculate option and in a fraction of seconds, you will receive your House Rent Allowance exemption. Q. How my HRA is decided by my employer? The type of city in which, employee is staying. In case of a non-metro city, 40% of basic salary is entitled to the employee for HRA. Whenever we are talking about House Rent Allowance, we must take in to consideration the sum of basic salary, Dearness Allowances and other commissions. Q. Which Proofs I must provide to get HRA exemption? You will not require any documentary proof if your House Rent Allowance claim is up to Rs. 3000 per month. If the claim amount exceeds, the limit of Rs. 3000 per month then you have to produce certain documents as proof of rent payment. The Rent Receipts:A completely filled rent receipt with all the required details, which include residence address, landlord’s name, the rent amount, signature of the landlord which is used as a verification of the rent accepted by him/her. You need to put a Rs. 1 revenue stamp on the rent receipt. Rental agreement in some cases: If the monthly rent exceeds the amount of Rs. 15000 per month or Rs. 1lakh a year, then in that case PAN Details of the landlord must be produced for claiming the House Rent Allowance exemption. Q. How can I get HRA benefits as well as deduction on Home Loan? If an individual pays interest for a home loan and he/she enjoys tax benefits on the interest of the loan, in that case also an individual can take HRA benefits provided to him/her by his/her employer. This is applicable when the employee owns a property, but has rented out that accommodation to someone else while he/she is living in a rented apartment, which belongs to someone else. In such a situation, the employee can earn from his own property while benefiting from HRA policy which eventually lessens his/her burden of paying rent for the house he has occupied. Q. How can I claim HRA exemption, if I don’t have my landlord’s PAN? Your landlord’s PAN is important, if you want to get HRA exemption and if you pay rent of more than Rs. 1lakh annually, this condition cannot be negotiated, you must get the PAN of your landlord and then do a rental agreement. Q. How can I claim HRA, if I am staying with my parents? You can claim a House Rent Allowance exemption only when, you pay rent to your parents. Make a rental agreement with your parents and take rent receipts from them. This will help you when you claim exemption. Q. I have not submitted my rent receipts to my employer, what should I do? There is no time limit to submit your rent receipts to your employer, but employers do keep a time limit for the submission of your rent receipts, in order to make things easy for them. If you have not provided your rent receipts to your employer for HRA exemption, you can provide it later, while filing income tax returns and by doing this you can directly get HRA exemption. For doing this you just have to adjust your taxable income and add HRA to it and then you can calculate your tax liability. In this case you will be able to claim deduction, if at all you have paid extra taxes.